Are you looking to get away this winter, spring or anytime in the future? Planning a Caribbean Beach Wedding alone or with Friends & Family? 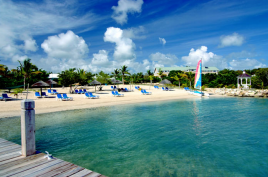 Consider one of these two 4* Resorts on Antigua, West Indies. Whether you want to get away just with your spouse, a friend or the whole family, both these resorts can accommodate any of your needs - from deluxe hotel rooms to 2-BR Villas on the Beach, to Day Spas, Kids Clubs, multiple Restaurants with excellent Food, Wine and premium Liqueur; All-Inclusive or just European Plan and where the temperatures area steady 28 C - year round! 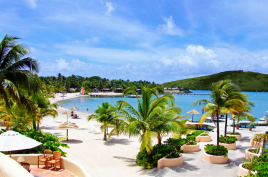 This superb offer is ideal for people in North America or Europe who want to use their frequent flyer points to travel; who don't want to "fit" into a fixed date package deal or who can find low-cost airfares to Antigua from their home country. A 50% VIP Discount off all regular prevailing room rates. There is no catch, no blackouts and no strings attached to this offer, other than being subject to availability for the time you are interested in. Note: For travelers from Canada, we will compare the costs with any package deals that exist with Air Canada Vacations, as that is often more economical due to the high charter and regular flight costs from Canada to Antigua! PLUS: Discounts apply for groups of 10 people travelling together - a great way to celebrate Anniversaries, Birthdays, Weddings & Reunions with family & friends! Combine your Wedding with your Honeymoon and get a terrific deal! Both resorts offer FREE wedding arrangements for stays of 7 nights or more (value over $1,000.00). Erika Keller at ekeller@mkaconf.com for a "no obligation" quote for the dates you would be interested in. Erika will be pleased to tell you all about the above 2 resorts, which she knows inside out. She will handle the bookings on your behalf or, you may book directly through the e-mail address on the flyers, quoting the Founding Member Names to receive the discount.